We’re excited that you’re interested in being a part of the worship team at Cornerstone! It is a fun, challenging, and rewarding ministry. If God has gifted you with musical or technical talent, we want you to be able to use it for His glory! We are looking for musicians, vocalists, and audio/visual workers with high energy, enthusiasm, and who have a passion for leading others in worship. We love seeing how God works through our Worship Team each weekend and hope you can be a part of that. 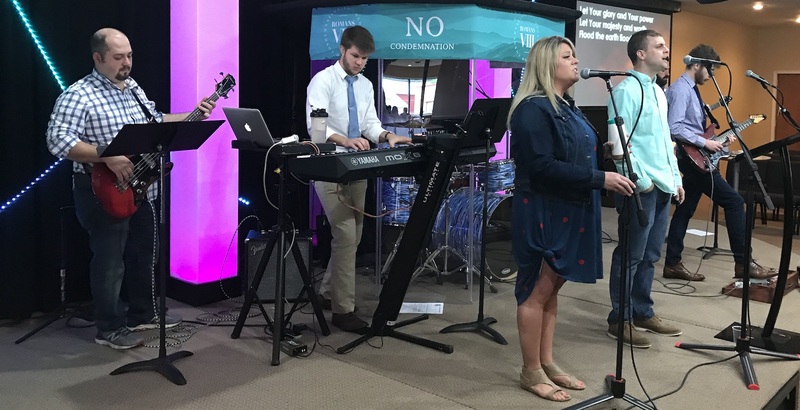 If you have a heart to lead others into meaningful worship, and you feel you are skilled with your voice or musical instrument, we would love to get to know you! Someone on the worship leadership team will contact you to schedule your audition time. After the audition, we will let you know if we feel that you are a good fit to join our worship team. We will then get you added into our planning center software and start scheduling you for practice and services. Auditions are, by nature, a little intimidating. We will try to make the process as relaxed as possible. Our goal is to help you discover your best fit with the team. We have people at many different skill levels, so the audition helps us evaluate how soon you can play and join the team. In some cases, it may be evident that an applicant’s skills have not developed enough to serve on a regularly scheduled basis. Should this be the case, we will graciously give some advice on how you can improve. After some time and practice another audition may be scheduled. During the audition, we ask that you come prepared to play or sing a song of your choice. Then we ask that you play or sing one the songs listed below with the rest of the team. Choose one of the following songs to perform with the worship team during the audition. We can provide chord charts and/or lead sheets for you to prepare. Worship on a platform is the overflow of a lifestyle of worship and a heart that is well-cultivated throughout the week. Personal spiritual intimacy with Jesus is our FIRST priority. One hour on a Sunday morning is a mere .6% of a week. If the only time you “worship” is .6% of your week, something is wrong. How can we lead people where we haven’t gone ourselves? We practice every Wednesday night from 6:30-8:30pm. We use Planning Center to schedule team members, to plan our songs each week, and to distribute chord charts . We expect all team members to come to practice prepared to play. On Sunday morning, the team arrives and is ready to play by 8:15am. We run through the music and then lead worship through both the 9:15 and 11am service. We are hoping to have enough people so that musicians and vocalists aren’t scheduled every week.